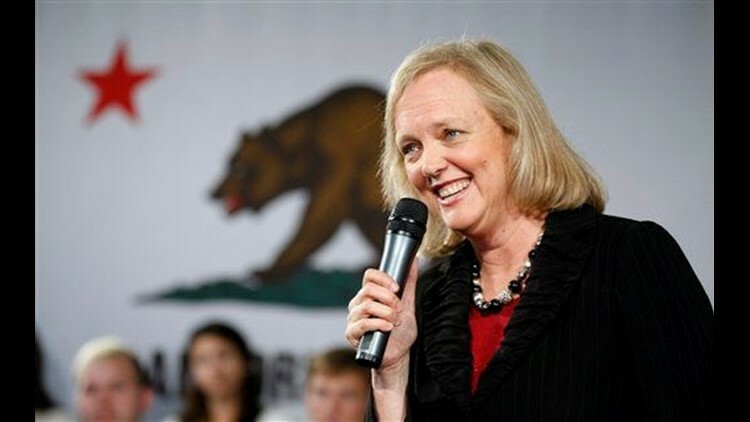 SAN FRANCISCO (AP) — Former eBay executive Meg Whitman is defending $119 million in contributions she has made to her campaign for California governor — a personal spending rate that has now surpassed that of any other political candidate in American history. Whitman's campaign this week reported another $15 million contribution from the billionaire GOP candidate in her bid to defeat Democratic Attorney General Jerry Brown. During a visit Wednesday to the San Francisco headquarters of Yelp, Whitman said the contributions from her personal fortune mean she won't be beholden to special interests if she wins. She also said she must spend a lot of money in a state where there are 2.3 million more registered Democrats than Republicans. "Our job is we have to tell my story, tell why I will be the very best governor for California," she said. "And then at the same time we have to acquaint Californians with Jerry Brown's record of failure." The $15 million contribution Whitman's campaign reported late Tuesday push her personal contributions past a previous record set by New York Mayor Bloomberg, who spent $109 million in his campaign for a third term last year. Bloomberg spent about $185 per vote for his re-election, and he did not take donations. Whitman, however, has spent the summer aggressively fundraising for her general election race against Brown. Her ads have played for months in every TV market in California. She said she has hired the best political team and needs to compete with unions that are spending millions of dollars to prop up Brown's campaign. Asked whether there is a limit to how much she will spend, she said, "It's not unlimited, but I just want to be sure that we're doing the right thing."